Day five. Book five. Nietzsche reminds marketers they need to be unsentimental when conducting human analysis. Well, it’s day five, and while in chronological terms we may still be in the shallows, in philosophical terms we find ourselves suddenly in deep water. It is time for the arch moral perspectivist Friedrich Nietzsche and his Aphorisms On Love And Hate. Described by the publisher as "blazing maxims on revenge, false pity and the drawbacks of marriage" this is a selection of "psychological observations" on the delusions, hypocrisies and fallacies that govern our morality, and is taken from the larger work Human, All Too Human. Published in 1878, it is an aphoristic prelude to Nietzsche’s seminal work of moral iconoclasm Beyond Good and Evil. Nietzsche applies a ruthless and dispassionate logic to questions of human nature, and expresses his conclusions with a trenchant assertiveness that is, frankly, hard to love. He constructs elaborate metaphor, not to convey the beauty or singularity of human experience, but to weave a thread of anti-morality through the fine porous holes in our intellect. His gifts to the world of ideas include the Will to Power, Slave Morality, Superman (with all of its subsequent Nazi overtones) and The Death of God. He feeds our humanity in the same way that extreme hardship makes us tough. So what can it teach brand builders? Well, in many ways this is exactly the sort of unsentimental analysis that marketing needs. We may be increasingly empathic in the way we deploy creativity, and sharing values may be an increasingly relevant approach for a brand, but the science by which the human psyche is stripped naked and its intimate contours revealed – this, surely, should be anything but cuddly. 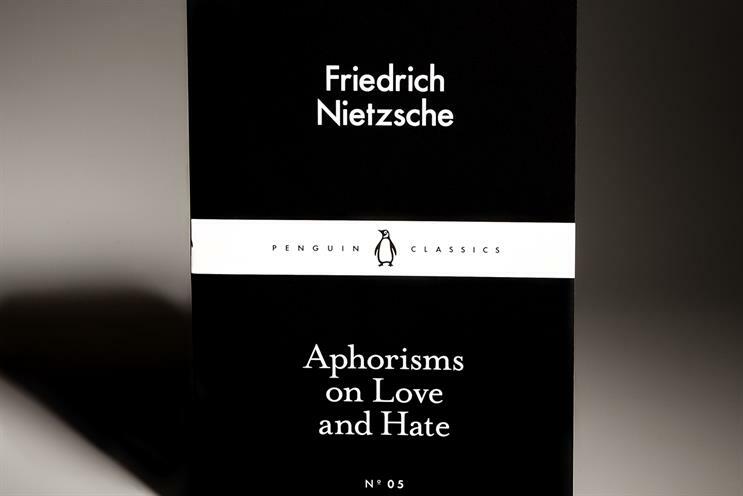 If this sounds mad, read Nietzsche’s aphorisms as though they were human insights being presented by an agency or a research company or cited as key direction in a client brief. Ask yourself whether the insight you last discussed at work was as heartlessly precise as Nietzsche’s observations. Take away the Prussian atmospherics, the aggressive atheism and the unfortunate place in history, and what you have in Nietzsche is the ultimate surgeon of the human psyche. He combines the sweeping canvas of moral anthropology with the forensic eye of behavioural economics. He gets to the (albeit Nietzschean) essence of love, hate, friendship, marriage, pity, revenge and trust, in a way that accompanied shopping and consumer proximity programs never do and never will.